Nomination Deadline: Nominations are accepted year-round, and nominations should be submitted by March 29, 2019, to be considered for the next class of honorees. Leads a successful business, organization or institution without compromising integrity for profit. Openly demonstrates an active commitment to ethical business principles. Promotes ethical behavior amongst peers and other stakeholders. Share a brief story that demonstrates the nominee’s commitment to ethical leadership in business. As a business leader, how is the nominee continually Being a Difference in the lives of others? 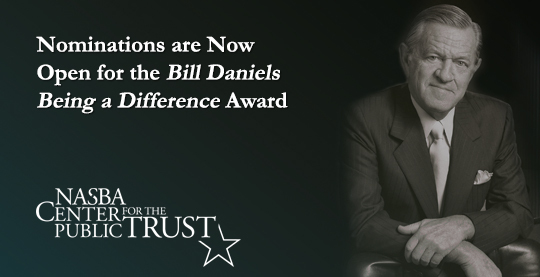 Bill Daniels Being a Difference Award recipients exemplify eight ethical business principles (Daniels Fund Ethics Initiative Principles: integrity, trust, accountability, transparency, fairness, respect, rule of law, and viability). Rate your nominee from 1-5 (defined on the form) on each of these areas. Select four of the ethics principles, and explain how the nominee excels in each you select (Up to 100 words will be allotted on the form). Share any additional comments you believe may be important to the evaluation of this nominee.